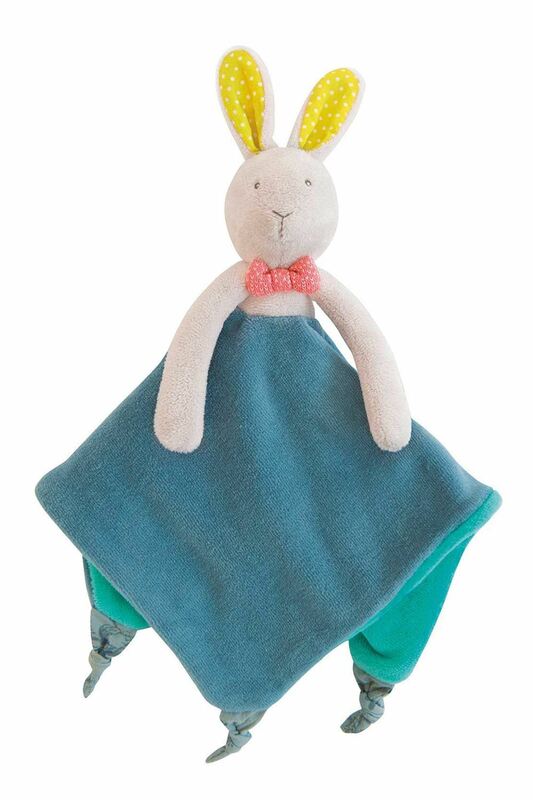 This is the Moulin Roty Mademoiselle Rabbit Comforter, this bow tie-wearing bunny is a super soft comforter with a handy little loop for holding on to a dummy. This is the Moulin Roty Mademoiselle Rabbit Comforter, the rabbit has long ears, lined in cotton poplin, and a bright pink bow tie. The 'blanket' is square and made of a soft, double thickness velour. Facial features are embroidered for additional safety. Three corners of the comforter are finished with a cotton knot – great for little fingers to play with.